Last year, the forum engaged with over 1,300 older drivers at these events to give those help and support to carry on driving safely for longer. There are currently just over 5.1 million people in the UK aged 70 and over driving on our roads and the expectation is that this will double if not treble in the next 20 years as we all live longer. The oldest person who holds a driving licence is a male aged 107 years. Hampshire is shown as having the highest number of older drivers outside London. Sergeant Rob Heard, Chairman of the Older Driver Forum, said: “The key message is about not becoming complacent about our driving. We know that many older drivers have a wealth of experience, confidence and tolerance. However as we get older our sight, hearing, reaction times and judgement of speed and distance may not be as sharp as it once was. We often pick up bad habits which become the norm without being aware of it. “The Older Drivers Forum can help by giving advice on voluntary driving appraisals to suit your needs or build confidence. “Our advice is don’t wait until you have a near miss or worst an accident to convince you to review you driving ability or to stop driving. Instead take preventative measures by planning ahead and seeking advice and support early. The number of older drivers on the roads has been increasingly steadily and this is expected to continue. By 2030 more than 90% of men, over 70 will be behind the wheel. Sgt Heard, added: “It’s an important to realise that ageing affects us all different and doesn’t necessarily mean a total loss of driving ability. There are many things an older person can do to improve and continue to drive safely, from modifying the vehicle, adapting the way they drive, and understanding and rectifying any physical issues that may interfere with driving. 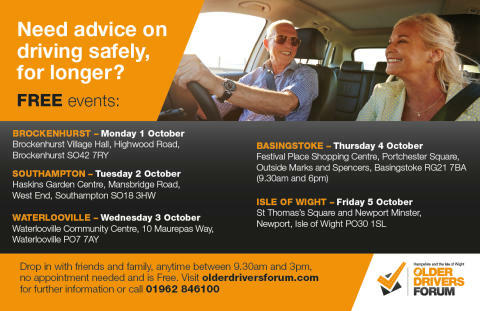 If you’re an older driver or concerned for a friend or relative who is still driving then the Older Driver Forum may be able to help. Please visit their website www.olderdriversforum.com for more information and details about the upcoming awareness week. The event is free to attend and open between 9.30am to 3pm, no appointment is required and people can pop in anytime during these hours. The events are aimed at anyone with an interest, from older drivers themselves, to friends and relatives.